Receding hairline is the first sign of baldness that further advances into bald patches on the scalp. Generally, hair starts receding in the shape of the ”M” letter, while the rest of hair starts to thin. If you start to notice hair on your towel and your hair begins to thin at the temple and crown of the head, then it’s time to pay your doctor a visit. Receding hairline is more commonly seen in men rather than women, but there have been cases. Even though hair loss has become one of major illnesses of today’s world, there is no cure for it yet. But tormenting yourself with questions like ”What did I do wrong?”, ”Why me?”, etc. will not do you any good nor will help solve the problem. What you need to do is learn the cause and possible ways to slow down the process. Most men lose hair due to aging and genetic. However, for some hair loss occurs as a result of some other illness, hormonal imbalance, medications or hair products. The bottom line is you’ll never know exactly why and there is nothing you can do about it. But what you can do is discuss your condition with your doctor and find the Receding hairline treatment that will best work for you. Here are the latest trends you may be interested in. Medications – The first thing almost all men do when hair starts to recede is take medications. And there are many pills that have shown great results, like minoxidil and finasteride that control hair loss and boost growth of new hair. Minoxidil is a powerful pill that contains DHT blockers that help stop hair loss. Finasteride is a synthetic anti-androgen pill that converts testosterone to dihydrotestosterone (DHT) and boosts hair growth. But this is a long-term commitment. If you decide to use medications, be prepared to use them your whole life. Note, the moment you stop taking medication, you will start to lose your hair again. Hair Replacement Surgery – Not all men are fans of surgery, but this is definitely one of the latest receding hairline treatments. It is actually an easy procedure that doesn’t hurt at all. First, doctor numbs the area to ensure a patient does not feel any pain during the whole process. He then removes healthy hair from the back of the head and transplants it on the affected area to restore the natural look. The first visible results can be expected 6 months after surgery. In the beginning you will experience shedding which is normal and within 6 months new hair will start to grow. 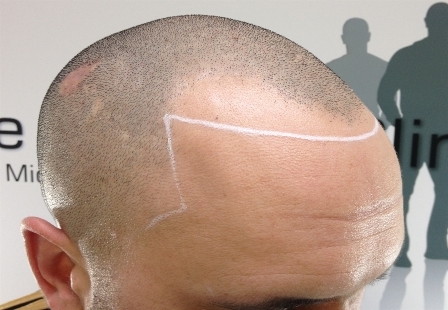 Scalp Micro-Pigmentation – Even though there are numerous treatments, none can beat scalp micro-pigmentation. It’s one of the latest trends in receding hairline treatments. It is the most effective drug and scar free hair loss treatment that provides men with head full of thick hair follicles. Since it is a hair tattooing process, this treatment requires skills and talent to perfectly replicate unique hair follicles. Doctors use different needles and colours to match the colour of your own natural hair, so that it looks as if your hair is growing back again. This ‘just shaved’ look is becoming increasingly popular among many known celebrities. But even though endorsed by celebrities, this receding hairline treatment is very affordable. Make an appointment to see if you are a good candidate for such treatment.